We’re on a mission to make the data Robin reports highly reliable, and part of how we get there is handling the folks in the office that don’t have Robin on their mobile device, either by choice or because they’re guests. We think this shouldn’t be a barrier to participate, and for the past month we’ve been working on something we think closes the gap. A new way to reliably find space, fast. 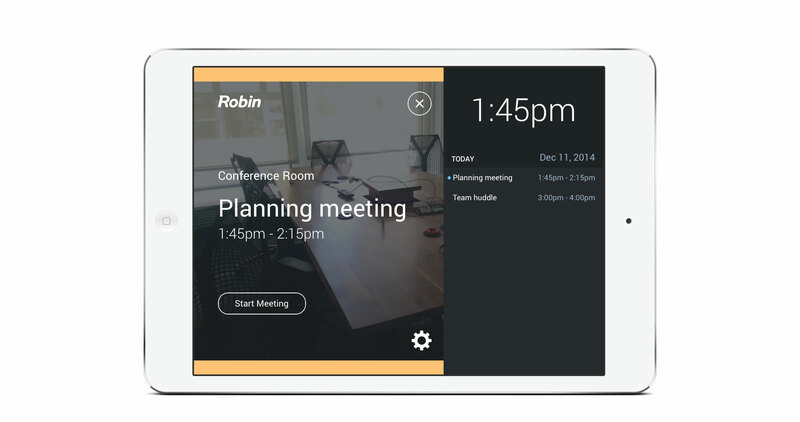 Cue Robin Rooms, our brand new tablet app, which gives members of your team a way to manually claim space for an impromptu meeting even if they’ve never downloaded the mobile app. Heck, Robin Rooms doesn’t even require beacons. An iPad mounted on the wall outside of a meeting space is an easy way to communicate the current status of the space and its agenda for the day. Like the web dashboard and mobile app, the display updates the status of the space based on activity. Know which rooms are available or not, in a glance. The Rooms app works best as an extension of Robin. If you have your phone running the mobile app with you, then the tablet app will automatically update the status of the space to “In Use” when you walk in to the room. That’s it. Just walk in. Once you leave, the space will revert to “Available” again. This status cascades throughout Robin, so your team knows which spaces are available on whatever device they’re looking at. Claim a space for an impromptu meeting, when you start the meeting. But if you’re not using beacons and the mobile app, it’s no big deal. Tap “Start Meeting” and pick one of the three lengths of the event. We value our time and know you do, too. 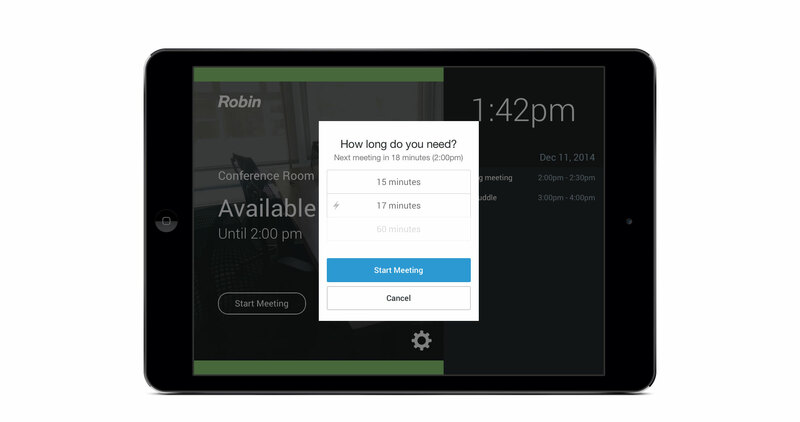 We’ve kept the default meeting times intentionally short; impromptu meetings shouldn’t last more than an hour. If you need more time, just press extend or if you have the mobile app, just stay in place and your presence will do the rest. Keep track of the day’s agenda. The app displays a third status for spaces booked through your existing calendar, but are currently empty. “Booked” spaces will update to “In Use” once someone enters the room with the mobile app or manually checks into the meeting from the tablet. As an added bonus, facilities and admins can see space usage analytics from the browser and pair existing calendars with meeting spaces. Robin Rooms is available for your iPad, and you can download it from iTunes. Want to learn more about Robin or have some ideas you want to share? @robinpowered and hello@robinpowered.com.